Kranj, January 31st, 2017 – For the past 20 years, Iskratel has been fostering a policy of collaboration with new, smaller, innovative and agile companies, which are known today as startups. Iskratel has systematically formalised its relationship with startups by setting up an investment fund, which also acts as leverage for developing the innovative solutions provided by startups. The company is looking to establish a broader form of collaboration with its partners, especially in the research and development and business areas. They are planning to invest at least 5 million euros in up and coming startups during the next five years, which is what the high-tech and ICT startup environment in SE Europe is potentially worth approximately. The company has already entered in its first partnership with the startup Gotoky. Iskratel’s newly established investment fund is an updated way of formalising the company’s practice of collaborating with smaller, innovative and agile companies, which it has been doing for the past 20 years. The fund was established with the aim of strengthening collaboration between large, internationally recognised, mature and experienced companies, which have built up an extensive sales and business network, and young and innovative startups. Iskratel wants to provide up and coming startups in Slovenia and SE Europe with sufficient start-up and development funds for the realisation of their ideas. But that’s not all. Besides funding, the ICT provider Iskratel also offers the possibility to collaborate with the company at all levels of infrastructure, including the areas of research and development and business. This is a segment of operation that smaller and less experienced startup teams clearly lack. Iskratel will provide their partner startups with prototyping and electronics manufacturing services, procurement solutions, exit control of final products, help with certifying HW products and sales distribution with an emphasis on new marketing channels, as well as an extensive range of services, including mentorship. The company has also set up the website www.iskratelstartup.com, where you can find all the information about the features that Iskratel supports and provides to their partners, the terms and conditions for collaboration and a partnership application form. This will allow Iskratel to provide a full range of supporting, developmental and entrepreneurial services primarily to high-tech startups. Iskratel is the founder and majority owner of RC IKT, which plays an important role by providing support and an operational basis for startups. Iskratel has already opened initial talks with Gotoky, a company that was placed on New Europe 100’s list of the hundred most promising startups in Europe. The Gotoky team has developed a smart walkie-talkie that enables communication in areas not covered by a GSM network. Gotoky operates via radio waves and the device has a range of 8 kilometres in the mountains and deserts if used by unlicensed users. Under ideal conditions the range is much longer, and in cities it has a range of almost two kilometres. The device enables users to talk to each other, send messages, positional data and even SOS calls in the case of an emergency. Iskratel doesn’t just see Gotoky as an investment opportunity, it also wants to collaborate with them in the area of research and development and is intrigued by the complementarity of the product portfolio in the public safety vertical. The investment will combine the startup’s innovation with the operational strength of a big company. This future collaboration with Iskratel will allow Gotoky to place a new and promising solution on the market. »In addition to its application in sports and the personal recreation of skiers, surfers and trekkers, Gotoky is also an indispensable tool when natural disasters render mobile networks in various areas (including cities) inoperative for several days or weeks. Being named one of the 100 most promising startups is a huge acknowledgement of our idea, which can only be realised with the help of a reliable and experienced partner. 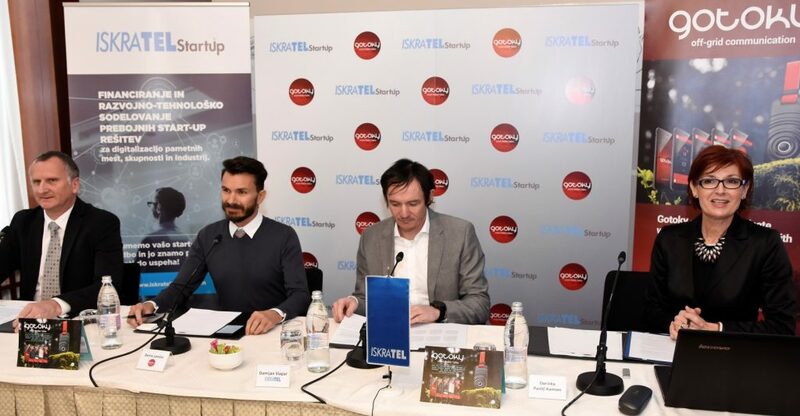 Iskratel is the perfect partner to help us overcome the obstacles during the course of this project,« said Gotoky’s CEO Denis Lončar when signing the contract. The support of Iskratel’s entrepreneur investment fund will allow Gotoky’s solution to appear on the market in May of 2017.